Oldmeadow seems ‘less a Traditionalist’ as I thought, or at least, in this collection of essays he does not come across as an original writer, rather an explainer of other people’s writings. “Touchstones Of The Spirit” is divided in three parts. In the first part, “Echoes Of Tradition”, the author introduces his readers to different traditions from Vedanta to Aboriginal and Amerindian. The second part is called “The Wastelands Of Modernity” of which the title says enough. Nice in this part is that the author tells us a bit about New Age icon Eckhart Tolle and his writings. The last part also has a fitting title: “East And West”. What is nice about the book is that Oldmeadow also makes references that other Traditionalists seem to prefer to avoid (for example computers) and that he is able to write from the perspective of a traditional society just as easily as from a Muslim of Christian one. The fact that he lists Nietzsche among “the false prophets of humanity” might disgruntle some (would be) Traditionalists. I found this book of Oldmeadow not really original, but he is well able to explain his varying subjects. 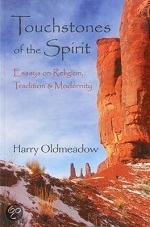 Also Oldmeadow seems less ‘hardline Traditionalistic’ as some other authors on World Wisdom. A note to e-readers. I got my ebook from the Kobo store, but however this book does have the good ebook-features such as footnote-previews, the book itself was quite awfull with fontsize changing every paragraph from normal to very small.